I shot this scene on a whim in the whee hours a few minutes from dawn along a dark county road between Jamestown and Chinese camp along California highway 49. The landscape is full of rolling valleys and hills leading up to the Sierra Nevada mountains to the east. 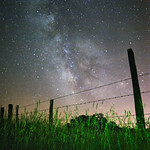 As I pulled over I noticed this fence and the tall dry grass that surrounded it and just as luck would have it the bright center of the Milky Way was almost perfectly aligned in formation behind the fence mimicking the angle of the fence posts. I love being able to capture a scene as it unfolds before my eyes. 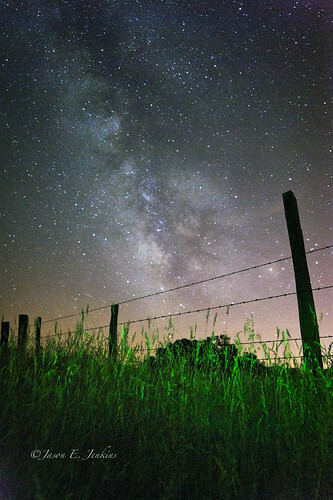 Within a few moments dawn was on the horizon and the Milky Way disappeared in the blue light of dawn. If you get a chance to gaze the Milky Way consider yourself lucky because light pollution is destroying our dark skies and gradually degrading views of this majestic ribbon in the sky. As you may notice in the image the presence of an orange glow along the horizon. This glow is from light pollution from the towns Oakdale, Modesto, and Merced, Ca. I would love to see more done to prevent light pollution so I can create more amazing images of the night sky. Thanks for Stopping by please feel free to comment or critique my work.